The start of fall is prime time for upland bird hunters who are pursuing woodcock. These secretive birds offer a unique challenge that keeps hunters coming back year after year. Woodcock are small woodland birds that can be tough to locate and difficult to shoot. However, if you follow these five tips you will have a better chance of bagging your limit woodcock hunting this fall. The first step in hunting woodcock is finding a productive location to hunt. The woodcock’s main source of food is earthworms, which is why they prefer wooded areas with moist soil. This can be a boggy area, swampy habitat, river flood plain or moist agricultural areas. Once you find a promising location, be prepared to cover some ground. Woodcock hunting requires some walking to find and follow the birds. To narrow down your area of focus, do some scouting beforehand, especially at dusk. When you find moving birds, you will have a good idea of where to concentrate your efforts. If you see one woodcock, you can bet that others are nearby. Like many migratory birds, woodcocks are on the move this time of year. This adds to the challenge, because you might find woodcocks in a location one day, but the next day they have moved on. The good news is that once you find a good location, it is likely that more woodcocks will be coming through the same area, so you must stay vigilant, frequently watching for bird activity. The flight of the woodcock may be the biggest challenge in hunting these little birds. When they flush, woodcocks can fly erratically, making them tough to hit. A hunter’s initial instinct is to shoot right away, when the bird flushes, but the better strategy is to be patient. Wait for the woodcock’s flight to stabilize and then shoot. You will dramatically increase your odds of success, by waiting for a good shot. You will have the best luck shooting woodcock with an open choke and smaller shot sizes. 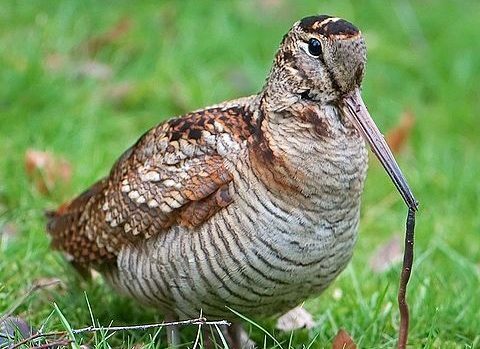 When walking in search of woodcock, it is not uncommon to go through long stretches without seeing a bird. This can make your mind wander, but you need to be ready, because a woodcock could flush at any time. If you are not concentrating, you will likely miss the opportunity when you do find a bird. A flushing or pointing dog can be beneficial in finding woodcock. The birds often hold up in thick cover, such as dogwood, goldenrod or viburnum, which makes it easy to pass them by if you’re hunting solo. A dog can help you locate birds you would never see otherwise. A dog is also helpful in finding a downed woodcock, which can be difficult to find when searching on your own. Some dogs even have difficulty finding woodcock, so make sure, when you shoot a bird, to take note of exactly where you saw it go down.